People all across the globe have become conscious towards the use of Eco-friendly products and thus the demand for reusable products has gone up in past years. One such product that contributes in a cleaner and greener environment and has significance in daily lives is Jute Bags. With the increasing use of jute bags these days, the demand for plastic bags has gone down. Several types of Jute Bags are available in the market. However, one such most special and demanded bag is Jute Beach Bag. These jute beach bags are ideally a perfect accessory for a day of relaxing on the beach. Jute Bags for Beach are used for carrying items like water bottle, books, towel, etc. Capable of accommodating small to medium sized requirements, these bags are a perfect blend of style and practical functionality. Now-a-day people have began adding variety of colors and shades that goes well with the subtle blue and green surrounding of the beach. They are intricately designed in stylish designs and patterns to enhance their appearance and make them exclusive. Besides, these can be personally designed, embroidered, printed with individual's name or initials to suit one's requirements and needs. 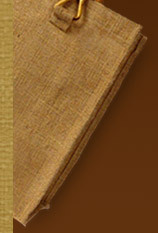 A Jute Beach Bag is given a stiff and firm appearance through lamination. This makes them resistible towards water and thus suitable for beach accessories. These Waterproof Jute Beach Bags can also be made in bright colors, bold prints and new patterns. Besides, these bags can be designed with side pockets, wooden handles or zips to change their appearance. Their sturdy handles enables a firm grip on the bag as well as equal distribution of weight reduces strain on user. 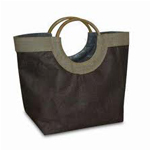 Since these eco friendly beach bags are completely bio-degradable, they do not cause any harm to the environment. Jute Beach Bags are considered to be the best option to carry as they provide extra space to toiletries, towels, books and much more.